Comforters not only keep you warm at night, they can transform an ordinary bedroom into an extraordinary place of tranquility and rest. Whether you are looking for elegant simplicity or an elaborate boho creation, our range has something for you.Everyone’s needs are different, so you’ll find both lightweight and heavier comforters in our collection. Many incorporate exclusive details and embellishments, including hand smocking and fabric flowers. 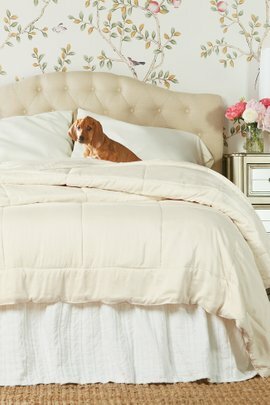 They also coordinate well with the rest of our bedding collection, including sheets, bedskirts, shams, and pillows.We’ve also taken care to ensure the quality of our comforters. These are expertly made for long-term use: The filler is evenly distributed to prevent sliding, keeping the weight of your comforter consistent. You, and your family, will be enjoying your comforters for many years to come.Of course, we assign a softness rating to our comforters, just as we do our apparel. Nurture yourself by browsing our selection of silk and linen comforters today.